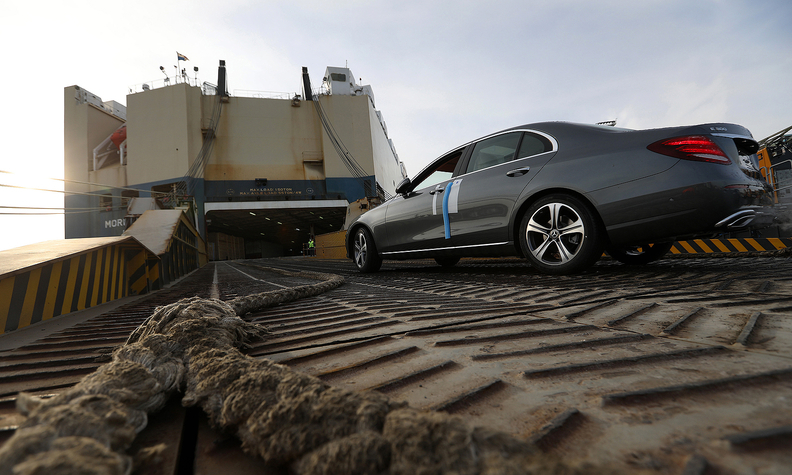 A Mercedes-Benz E -Class sedan is loaded on the cargo ship Morning Lily, ahead of export from the BLG Logistics Group terminal at Germany's Port of Bremerhaven on Jan. 22. Import-brand auto dealers are being encouraged to mobilize against the Trump administration's proposed tariffs on light vehicles by traveling to Washington in April to voice opposition with Congress and other government representatives. "We really want to get more dealers involved in this issue," California dealer Howard Hakes said during the NADA Show here Sunday. "There's no question that import tariffs are the biggest issue we're facing this year and dealers' voices need to be heard." Hakes, president of Hitchcock Automotive Resources of City of Industry, Calif., took up his role Sunday as chairman of the American International Automobile Dealers Association, the trade group that represents 9,600 international nameplate automobile franchises. Hakes said that as the trade group's 2019 chairman, he is working with NADA to encourage retailers to talk with congressional representatives and with elected officials at the state and local levels. AIADA has a "Fly-In" scheduled for April 9-10 in Washington to provide education about trade issues and to facilitate dealer meetings with government officials. "Right now, it's been the old 80-20 rule on this topic," Hakes said outside of AIADA's annual meeting and luncheon, where he addressed dealers for the first time as association chairman. "Twenty percent of our dealers are doing 80 percent of the work. We need more involvement this year. We're going to make it clear in Washington that free trade is in our best interest." President Donald Trump has proposed using the "Section 232" trade tool to slap a punitive 25 percent tariff on imported vehicles, although he said in November that he will hold off on a decision for now. Bipartisan proposals have emerged in both the Senate and House of Representatives to reduce the president's ability to unilaterally impose trade tariffs, Politico reported Friday. But auto industry officials have been living on pins and needles for the past several months over the prospect of having to pass billions of dollars in government tariffs along to consumers in the form of higher sticker prices. In speaking to the AIADA audience Sunday, Bob Carter, executive vice president, sales, for Toyota Motor North America, called some of the tariff proposals "ridiculous." "Tacking a 20 to 25 percent tax onto all vehicle and vehicle parts imported into the U.S., or restricting them through quotas, is an unnecessary, direct hit by the government on an otherwise healthy industry," Carter said. He encouraged dealers to take that message to their elected officials. "Whether at a fly-in, or in your personal conversations, it is crucial to keep up this fight," Carter told the audience. Industry leaders like Carter and Hakes are walking delicately over the Trump administration proposals. Hakes has been an active participant in Republican party activity. According to his AIADA bio, he serves on the board of the California Republican Party, is vice-chairman of the Republican party of Los Angeles County, and was appointed by the president to serve on the Department of Health and Human Service's Drug and Alcohol Prevention Board. In an interview with Automotive News outside of the AIADA meeting, Carter emphasized that he did not want to indulge in political discussions while making Toyota's wishes known in Washington. "We sold 2.8 million vehicles in North American last year," Carter told Automotive News. "We can't sell that many vehicles to only 50 percent of the population," he said, referring to the nearly 50-50 split among American voters in recent years. "I want to make it clear that what we're talking about is not politics – its policies," Carter said. "Our belief is that when we talk about a policy of free trade, everyone wins. "Whenever someone talks about imposing a tariff to make this country or that country pay more – you know, countries don't pay tariffs. Consumers pay the tariffs. It's just a tax on the consumer."